Try our 2 new additions now! Hi I’m Karina Elle, a fitness model, trainer, and wellness coach. Living a healthy lifestyle doesn’t need to be hard, in fact it should be totally enjoyable. You don’t have to spend hours in the kitchen meal prepping to see results. 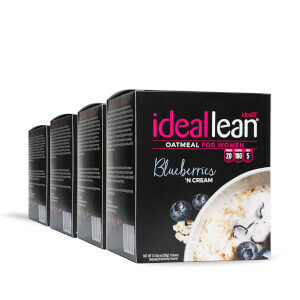 IdealLean Oatmeal is exactly what you need to get in a healthy breakfast in a matter of minutes, to help you reach your fitness goals faster. Starting your morning with a healthy breakfast helps you to control your weight by kick-starting your metabolism, and will help keep you energized to get through your morning. 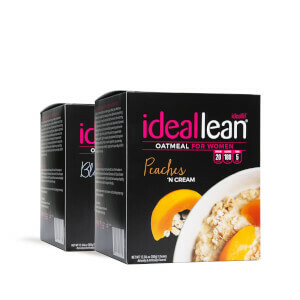 IdealLean Oatmeal contains 20g of whey and milk protein to support lean muscle growth, 22g of complex carbohydrates for long-lasting energy, and 5g of fiber to aid in digestion. It is the fast, convenient, and deliciously clean breakfast or anytime snack you need for great results. Fueling your body with the right foods is half of the battle for any fitness journey. Your nutrition needs to be on point to get the results you want. That’s why IdealLean Oatmeal makes it simpler and tastier than ever to supply your body with the nutrients it craves to speed up all of your hard work. Unlike many instant oatmeal options on the market that are often high in carbs and sugar, IdealLean Oatmeal is a high protein, low carb breakfast that provides you with long-lasting energy and hunger control, with about half the carbs and sugar as other brands. And because protein is vital to your success both in and out of the gym, we include IdealLean’s made-for-women protein to provide your body with muscle-building nutrients you need to support a lean, strong physique. It also features natural whole-grain oats and real fruit, for whole food goodness. Can I view IdealLean Oatmeal's nutrition facts? Oats Instant Rolled Whole Grain (Baby), Non-Fat Dry Milk, Whey Protein Concentrate, Milk Protein Conc, Oat Fiber, Natural and Artifcial Flavors, Organic Evaporated Cane Juice, Freeze Dried Cultivated Blueberry, Sucralose. How many packets are in each box? How does IdealLean Oatmeal promote weight loss? 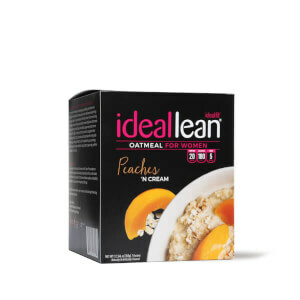 IdealLean Oatmeal supplies you with only 20g of carbs while supplying 20g of protein. This can be used as an entire meal and only contains 180 calories while still filling you up. What is the best way to use IdealLean Oatmeal? IdealLean Oatmeal is most beneficial when eaten for breakfast. It will provide you with 20g of protein as well as 5g of fiber and 20g of good, healthy carbs to help keep you full longer. What are the top benefits of Oats? b.) Shown to decrease hunger by promoting CCK release while decreasing insulin release. c.) High fiber content helps aid in digestion. Why is whey protein used in an oatmeal? We use whey protein in order to give our customers a quick absorbing protein that can immediately aid in muscle protein synthesis and help aid in hunger control. How much water should I use in my oatmeal? 2 oz of hot water is recommended but if you like your oatmeal thinner more can be used. Can I microwave my protein oatmeal? Yes, you have the option of either microwaving your oatmeal with 3 oz of cold water for 30 seconds or mixing with hot water for 2 seconds. Where do the 9g of sugar come from in the oatmeal? The organic evaporated cane juice as well as the fruit pieces. How hot does the water have to be in order to mix the oatmeal? The water does not have to boil but should be warm to the touch. The hotter the water, the softer the oats will be. How many packets can I eat per day? 1 packet is suggested in the morning and 1 could also be used as a snack or meal throughout the day as well.